Miles the rat is very stressed, caught in the rushing web of city life. He’s always on the clock and everything is super scheduled. It’s sleep time, dinner time, work time, dance time, nap time, tv time. Eventually he has a meldtdown (a child friendly one) and his mom calls him and tells him he has to go on holiday. So off poor ratty Miles goes goes to the countryside. There, he meets the strong and capable field mouse Melissa. Rather than working to the clock, Melissa moves with the rhythms of the sun and the moon. It takes awhile for Miles to adjust. He’s loud and plays his music late at night. He leaves his papers lying all over the place and is freaked out by the chickens on the farm. All these things that are alive and organic are unfamiliar. The country rhythms are beyond him and things are tense between him and Melissa. He’s also anxious that there’s no strict schedule. But Melissa is patient and makes up a song to help him to relax. They go on a bike ride together and she shows him that the chickens are not scary, that they are calm so long as you are. She teaches him the joy of watering the flowers and growing veggies, the simple pleasure of sweeping the floor and walking in the country. Slowly he regains his balance and starts enjoying life. In turn, he brings some energy into Melissa’s bucolic life, show her that sometimes it’s fun to have a dance and enjoy a party and meet people. This simply story, designed especially for children between the ages of four and six, is played by the effervescent Roberto Pombo, and the warm silky Ameera Patel. These top-notch actors, who are perfectly cast for their roles, bring their talent to the fore in the belief that children’s theatre must be the best theatre. “We really are quite passionate about making good meaningful stories for young people,” says Davis. Aligned with Assitej SA, who partly funded the show, Davis holds that the children must be able to connect with the story. Standards are high, the children are, after all, the audience, or the theatremakers, of the future. Davis says along with great actors giving the best of their craft, there is a lot of playfulness. Pombo and Patel are delightfully physical actors, able to mime and clown to great effect. “There is a lot of fun play and visual clowning as they (the characters) draw closer over a series of very short days,” says Davis. The set, which rotates, is also “very visual”. The play was developed for the Cradle of Creativity Conference, an international Assitej gathering to develop children’s theatre, that was this year held in Cape Town. Davis says Yvette Hardie, who is president of Assitej, put out a call for plays to be developed for very young children, as very few of them exist in South Africa, whereas internationally, there are theatre companies that specialise in just creating theatre for specific age groups, even for babies. 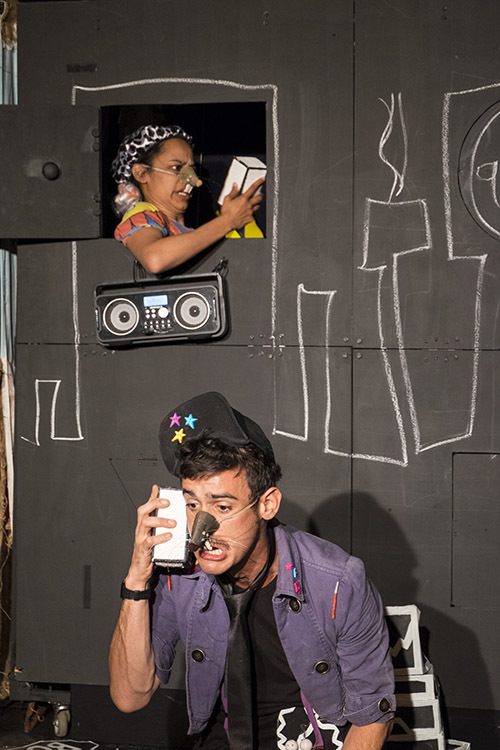 Possibly the first play made for babies in South Africa, says Davis, was Scoop by the Magnet Theatre, and then Patchwork, created by Pillow Fort productions, thanks to Assitej’s involvement. Davis, who has also received funding from the Lotto, responded to Hardie’s call and threaded the environmental themes her company, Well Worn Theatre, is known for, into the work. With her partner Luke Buckland and their toddler, she has made a journey similar to Miles’s, swopping the Joburg urban jungle for the natural splendour of Hogsback. Together with a subtle eco-friendly message, she conducted a lot of research into what interests four-to-six-year-olds. It is a stage in their development when they are interested in opposites. Day and night, happy and sad, fast and slow, these are things that intrigue them, she says. It is also a stage in which relationships are beginning to develop as they start building their first friendships. Yet the play is kept at 35 minutes long, as that is the average amount of time the target audience can concentrate. But with Ameera Patel and Roberto Pombo on stage, the play is also enjoyed by the parents. Rat Race is on at the National Arts Festival at 09h30 every morning until Saturday 8 July. Come on, spoil your children with some good theatre. Book here.